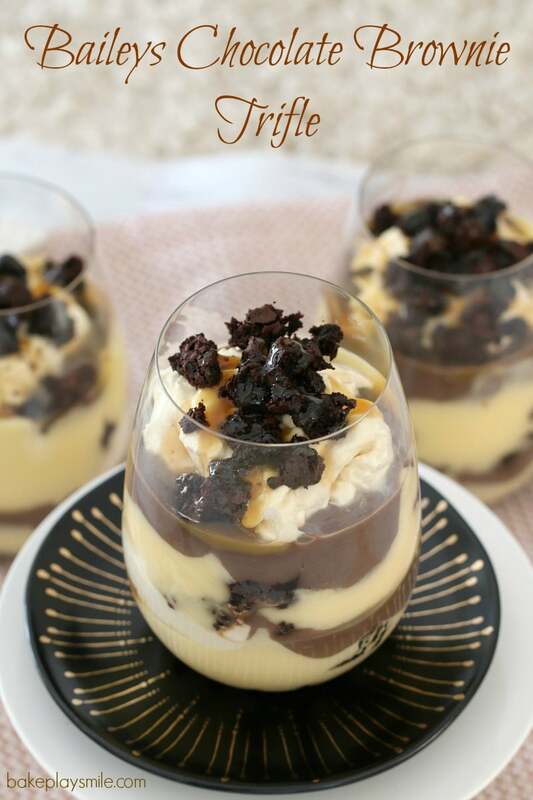 The most decadent layered Baileys Chocolate Brownie Trifle – filled with rich chocolate brownie, vanilla custard, whipped cream, Baileys Irish Cream, chocolate custard and salted caramel sauce… this one is for the true chocoholics!! I have to admit that I’m not a massive fan of a traditional trifle. I think there’s something about wet sponge cake that just really puts me off! Do you know what I mean?? 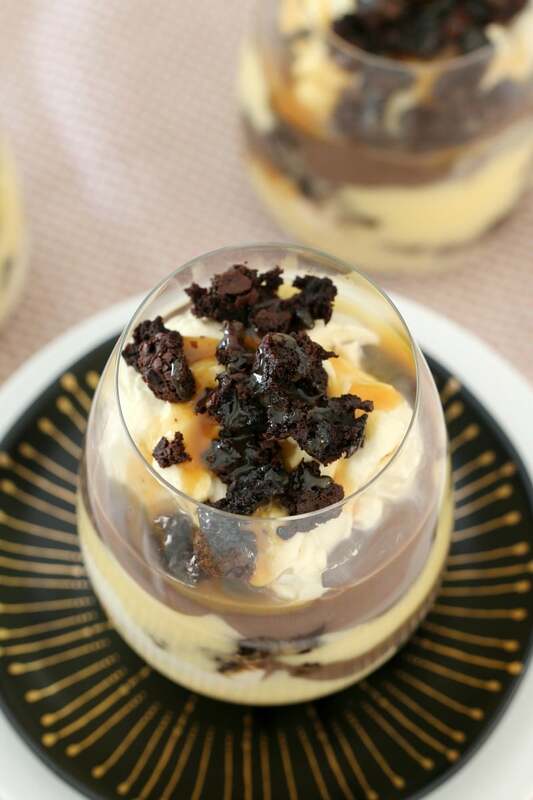 But THIS Baileys Chocolate Brownie Trifle is the total opposite. It’s insanely delicious! So, I suppose that this really isn’t a traditional trifle at all! Rather than sponge cake, I’ve used a rich chocolate brownie. 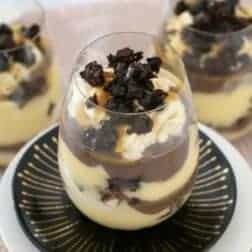 It’s still got lots of yummy ‘traditional trifle’ layers… except these ones are WAY BETTER!!! Think vanilla custard, whipped cream, chocolate custard, Baileys Irish Cream, salted caramel sauce AND more of that delish chocolate brownie. Yep, this is one over-the-top dessert. You can make your own brownies (like this one) or you can use a brownie packet mix or even just a store-bought brownie. Whichever you choose, know that you’re in for one decadent dessert! To whip these cheeky little things up, you’ll need a few individual glasses or bowls (or if you prefer, you could make one large trifle). I used 6 large glasses, but this quantity could easily make 10 smaller serves. Then it’s just a matter of roughly crumbling up some chunks of brownie into the bottom of the glasses and pouring over a splash of Baileys Irish Cream (the brownie will soak up the Baileys making it taste sooooo good!). You can use as much or as little Baileys as you like. And then start adding your other layers of vanilla custard, whipped cream, chocolate custard and salted caramel sauce… and then repeat! 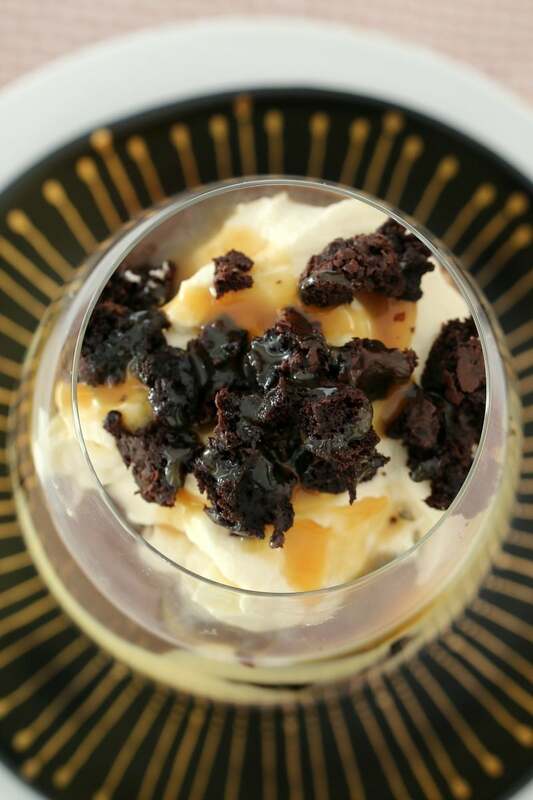 Finish it all off with another crumble of chocolate brownie and a drizzle of salted caramel sauce. AHHHH-MAAA-ZING!!! If you’re worried that you might need to do a 50km marathon after eating this totally decadent dessert, don’t be. 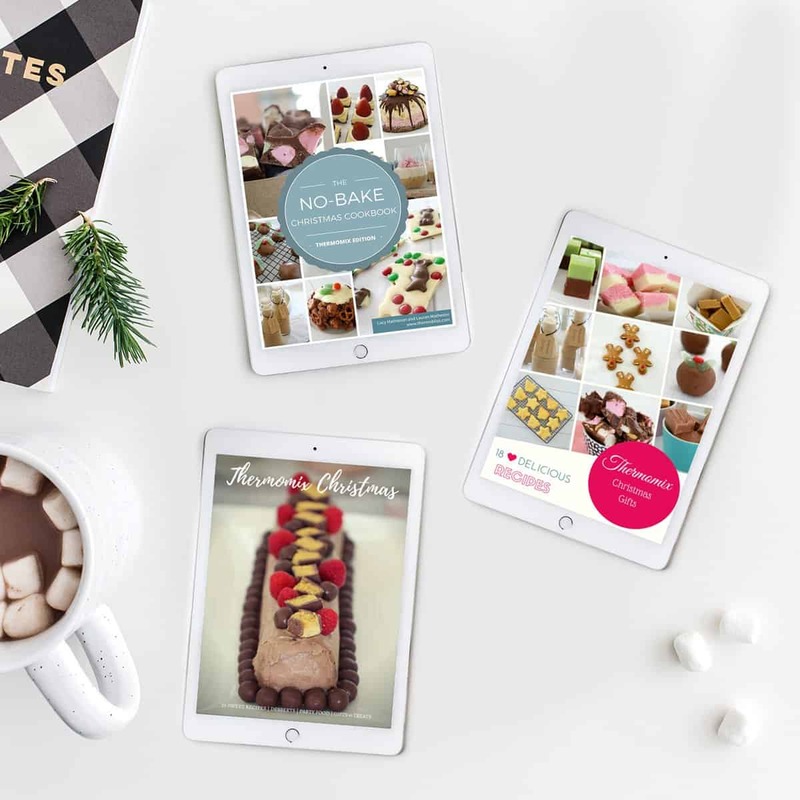 We all know that there’s some unspoken rule that Christmas calories don’t count (right…. right!!??). So go on, treat yourself to one super amazing and totally pimped up trifle! 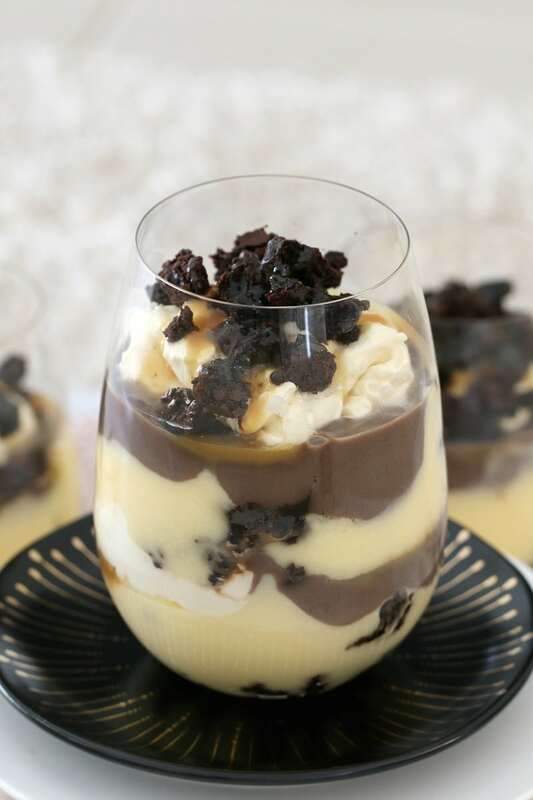 The most decadent layered Baileys Chocolate Brownie Trifle - filled with rich chocolate brownie, vanilla custard, whipped cream, Baileys Irish Cream, chocolate custard and salted caramel sauce... this one is for the true chocoholics!! Baileys Irish Cream as much or as little as you like! Place 6 large individual serving glasses onto the bench (or 8-10 smaller glasses). Crumble the cooked chocolate brownie into small chunks. Divide 1/3 of the brownie chunks between the serving glasses. Pour over a small amount of Baileys Irish Cream (the brownie will soak up the Baileys). Spoon over half of the vanilla custard, half of the whipped cream and half of the chocolate custard (in layers). Drizzle over 1/3 of the salted caramel sauce. Repeat all of the layers once more (including the Baileys Irish Cream). Finish off with the remaining 1/3 chocolate brownie and the salted caramel sauce. Place into the fridge until serving. You’ve done it again! 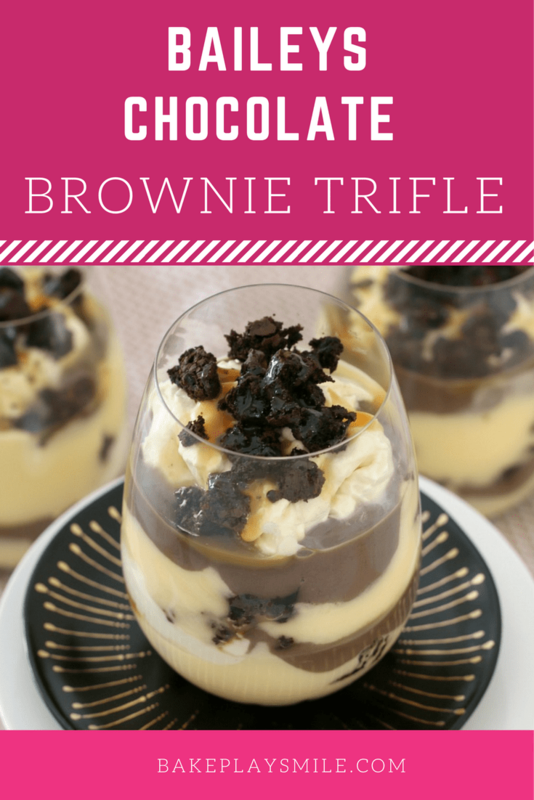 Baileys + Brownies + Trifle = The Dessert Trifecta! Perfect to serve up at the end of a dinner party. Smiles all around. Hahaha we’re definitely on the same page!